We offer ingredient quantities for 1 serving, 2 servings and 4 servings. Prep is very short but it needs 4 hours+ or overnight chilling time in the fridge. The prep time is truly almost instant BUT the ingredients need to party together to make it set nicely. So make it the night before. In the morning, take it from the fridge and add anything else you might fancy, eg berries, banana, vegan granola (honey-free) - or a mixture of all three. Lush! Chia seeds aren't just a trendy new ingredient - they are full of calcium, a good source of protein and are ace in dishes like this one or in a hot porridge. Although they might seem expensive, they go a long way - and supermarket own-brands can be much cheaper. Find them in large supermarket branches, health food shops and the like - Aldi sells them in its new, budget superfoods section! Chia seeds are safe for those with regular nut allergies unless they have a specific allergy to chia seeds themselves! However, those with tree nut allergies (eg peanuts/coconut) need to buy their chia from companies who don't use mixed production lines. Whole chia seeds are probably the safest. 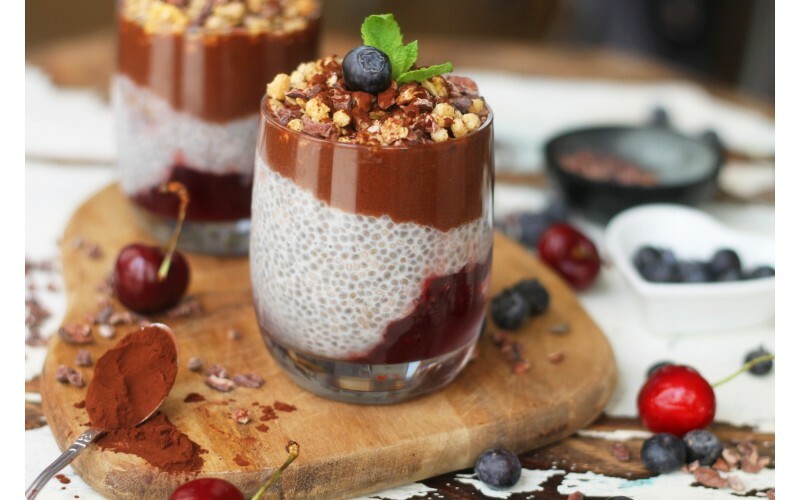 Pressed or ground chia seeds may be processed in a plant that also processes tree nuts or coconut and thus carries the risk of contaminating the processed chia. Any such contamination can trigger a severe allergic reaction in those who have a severe allergy to tree nuts or coconut. Granola: 1-2 tbsp per portion. Use a vegan type (honey-free). For a vegan and gluten-free version, try brands like Amisa, Nature's Path, Planet Organic or Superfoodies. Non-blended version: add all ingredients (except agave syrup if you're using it) to a mixing bowl and whisk vigorously to combine. Let it rest covered in the fridge overnight or at least 3-5 hours or until its consistency becomes like a mousse or similar pudding. Taste and add extra syrup of your choice if needed. Blended version: add all ingredients to a blender and blend until completely smooth and creamy, scraping down sides as needed. Layered version, as in the picture: soak the chia seeds in the milk and set them aside. Make the chocolate mixture separately. Then place one layer of chocolate mixture, a layer of chia and the final topping of chocolate! If you want to integrate fresh fruit or jam, simply create another layer. It is best when fresh but can be refrigerated in an air-tight container for 2-3 days.